Download "Department of Political Science"
2 2 Department of Political Science POLS 302 U.S. Political Parties and Elections Credits: Foundational, institutional, and behavioral features of American political parties and elections. POLS 303 Politics of Organized Interests Credits: Role of interests in varied forms: social movements, institutions, associations, and membership groups in American politics. POLS 304 Legislative Politics Credits: Structure, organization, behavior, processes, and policy implications of U.S. legislatures. POLS 305 Judicial Politics Credits: Allocation of powers among judicial structures in American federal system. POLS 306 Executive Politics Credits: Structure, organization, behavior, processes, and policy implications of U.S. executive leadership. POLS 309 Urban Politics Credits: Governmental structures and political processes in urban government. Prerequisite: POLS 101 or POLS 103. POLS 320 Empirical Political Analysis Credits: Methods of empirical political inquiry. POLS 321 Empirical Political Analysis Laboratory Credit: 1 (0-2-0) Laboratory applications of empirical research methods. Registration Information: Concurrent registration in POLS 320. POLS 331 Politics and Society Along Mexican Border Credits: Analysis of U.S.-Mexican relations and domestic politics as these affect regional characteristics and development of U.S.-Mexican border region. POLS 332 International Political Economy Credits: Also Offered As: ECON 332. Theories on relations between international politics and economics. Policy implications of different theories and case studies. Prerequisites: (ECON 202 or AREC 202) and (POLS 232). Registration Information: Credit not allowed for both POLS 332 and ECON 332. POLS 341 Western European Government and Politics Credits: Politics in Western European countries such as Britain, France, and Germany, and countries influenced by European traditions. POLS 345 Russian, Central, and East European Politics Credits: Political structures and processes in Russia, Central and East Europe, and selected post-communist countries. POLS 351 Public Administration Credits: Government organization and management; decision processes; political and intergovernmental relations in administration. POLS 361 U.S. Environmental Politics and Policy Credits: Public and contemporary issues relating to U.S. environmental policy. 3 Colorado State University 3 POLS 362 Global Environmental Politics Credits: Cross-national and international contexts of environmental politics and policy. Prerequisite: POLS 232. POLS 364 U.S. Energy Policy Analysis Credits: Discussion and analysis of energy use and its impact on the economy and environment with an emphasis on future policy. POLS 371 U.S. Space Policy Credits: Analysis of U.S. space politics, space law, and space policy making. POLS 405 Race and Ethnicity in U.S. Politics Credits: Relationships among American racial/ethnic groups, political attitudes, behavior; race and ethnicity roles in elections; implications for public policy. POLS 409 Urban and Regional Politics Credits: Governance processes and public policies in metropolitan regions. Prerequisite: POLS 101 or POLS 103. POLS 410 American Constitutional Law Credits: Allocation of powers among structures in American federal system. POLS 413 U.S. Civil Rights and Liberties Credits: U.S. Constitutional provisions and cases pertaining to the rights and liberties of individuals. Terms Offered: Spring, Summer. POLS 420 History of Political Thought Credits: Issues and texts related to tradition of political thought from the ancient through the modern period. POLS 421 Contemporary Political Theories Credits: Major political theories and ideologies of contemporary times. POLS 422 Democratic Theory Credits: Competing approaches to the theory and practice of democracy, both locally and globally. Registration Information: POLS 101; completion of AUCC category 2. POLS 423 American Political Theories Credits: Major American theories and ideologies: their development and present uses. POLS 431 International Law Credits: Rules and obligations for conduct of relations among states and other international entities. Prerequisite: POLS 232. POLS 433 International Organization Credits: History, development, structure, process, and activity of selected public international organizations. Prerequisite: POLS 232. POLS 435 United States Foreign Policy Credits: Institutions, responsibilities, processes, and issues in formulation and execution of U.S. foreign policy. Prerequisite: POLS 232. POLS 436 Comparative Foreign Policy Credits: Effect of varying international and domestic contexts on foreign policy choices and outcomes across different countries, cultures, issues, and time. 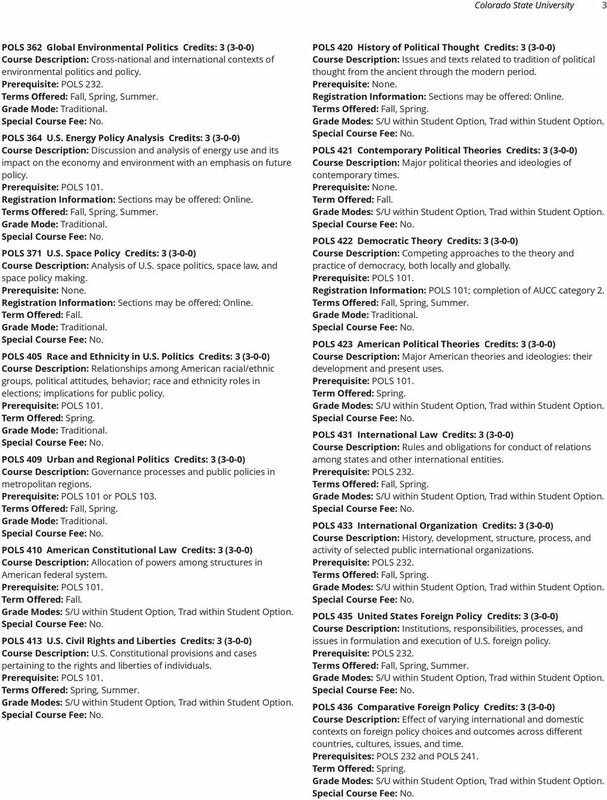 Prerequisites: POLS 232 and POLS 241. 4 4 Department of Political Science POLS 437 International Security Credits: Examines the conditions that make for war and peace in international relations. POLS 442 Environmental Politics in Developing World Credits: Examines environmental politics in developing countries and evaluates climate change, natural resource governance and environmental justice. POLS 443 Comparative Social Movements Credits: Reviews major works dealing with conceptual and theoretical foundations of social movements and examines a number of cases across regions. POLS 444 Comparative African Politics Credits: African political systems focusing on precolonial, colonial influences; rise of nationalism; approaches to new political order; influences of development. Terms Offered: Spring, Summer. POLS 445 Comparative Asian Politics Credits: East and South Asian political systems emphasizing issues of development, political culture, and institutional change. Terms Offered: Fall, Summer. POLS 446 Politics of South America Credits: South American political actors and institutions with emphasis on themes of development, democracy, revolution, and international affairs. POLS 447 Politics in Mexico, Central America, Caribbean Credits: Mexican politics with comparison to one or more Central American and Caribbean countries. POLS 448 Comparative Racial/Ethnic Politics Credits: Comparative examination of politics of race and ethnicity and role it plays in formation of nation-states. POLS 449 Middle East Politics Credits: Political issues of the Middle East, including the Palestinian-Israeli conflict, Islamism, and democratization. POLS 451 Public Policy Design and Governance Credits: Examination of governance institutions outside the scope of traditional bureaucratic organizations and accountability. Prerequisite: POLS 101 or POLS 103. Registration Information: Junior standing. POLS 459 Program Evaluation for Public Administrators Credits: An overview of research methods and statistical methods for public administrators. Registration Information: Junior or senior standing. Sections may be offered: Online. POLS 460 Public Policy Process Credits: Explanations of U.S. policy formation, implementation, and impact. Registration Information: Junior standing. Sections may be offered: Online. POLS 462 Globalization, Sustainability, and Justice Credits: Public and private policies to promote sustainability and social justice in a globalizing world. Prerequisite: POLS 232 or POLS 241. 5 Colorado State University 5 POLS 463 Urban Policy and Management Credits: Policy choices and management issues associated with urban government. Prerequisites: (POLS 101 or POLS 103) and (BUS 300 or CHEM 301 or CO 300 or CO 301A or CO 301B or CO 301C or CO 301D or CO 302 or JTC 300 or JTC 301 or LB 300). Registration Information: POLS 101 or POLS 103; completion of AUCC category 2. POLS 465 Public Policy Analysis Credits: Methods and tools used in the practice of policy analysis and evaluation of current public policy; emphasis on applied analysis. Registration Information: POLS 101; completion of AUCC category 2; junior standing. Sections may be offered: Online. POLS 486A Practicum: Legislative Politics Credits: 6 (0-8-2) Registration Information: Must register for laboratory and recitation. Special Course Fee: Yes. 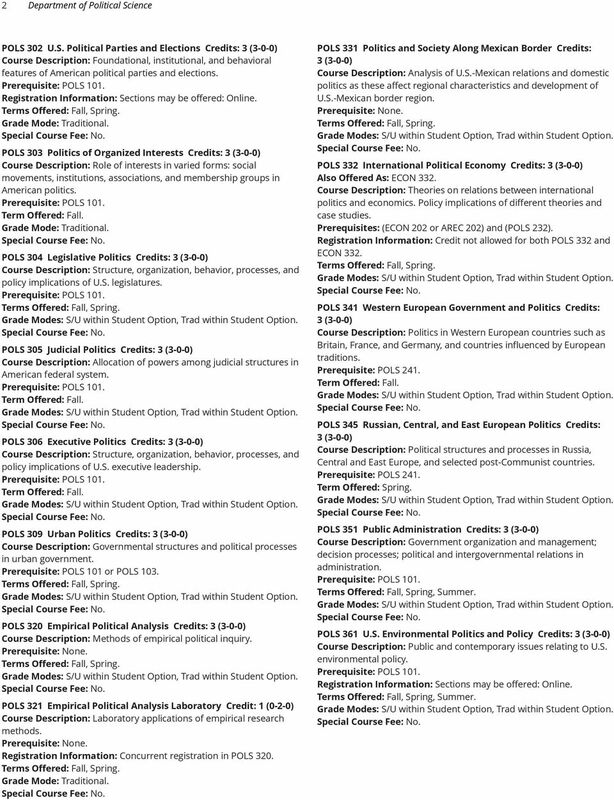 POLS 486B Practicum: Government Credits: Var[1-6] POLS 492 Capstone Seminar Credits: 3 (0-0-3) Registration Information: Must have taken upper-division course in at least four subfields of political science. 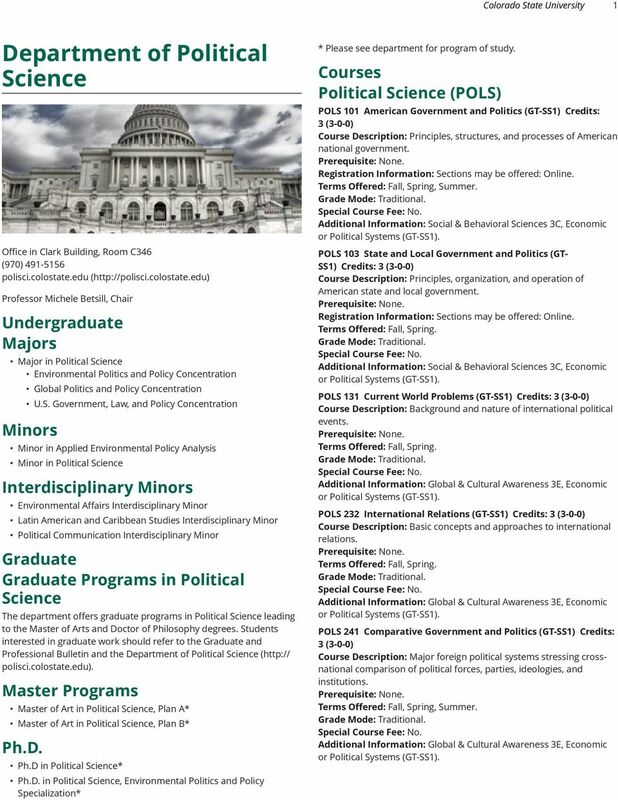 POLS 495 Independent Study Credits: Var[1-18] POLS 500 Governmental Politics in the U.S. Credits: Selected primary source materials on performance of government officials and institutions at federal, state, and local levels. Registration Information: Must have taken three upper-division credits in American politics with a grade of B or better. POLS 501 Citizen Politics in the U.S. Credits: Selected primary source materials on behavior of individuals and groups in American politics. Registration Information: Must have taken three upper-division credits in American politics with a grade of B or better. POLS 509 Gender and the Law Credits: Relationship between gender and the law and the changing nature of that relationship over time. Prerequisite: POLS 410 or POLS 413. POLS 520 Theories of Political Action Credits: Intensive review of primary material on Western political thought. Prerequisite: POLS 420 or POLS 421. POLS 530 International Relations Credits: Theory and methodology utilized in different approaches to international relations. Registration Information: Nine credits in international relations or related studies. POLS 531 Policy Making, Diplomacy, and World Politics Credits: Theories of policy making and bargaining in international politics as applied to different countries, organizations, and historical periods. Registration Information: Three upper-division credits in international relations with a grade of B or better. POLS 532 Governance of the World Political Economy Credits: Theoretical and practical debates on the organization and governance of the world political economy. Registration Information: Nine upper-division credits in international relations with a grade of B or better. 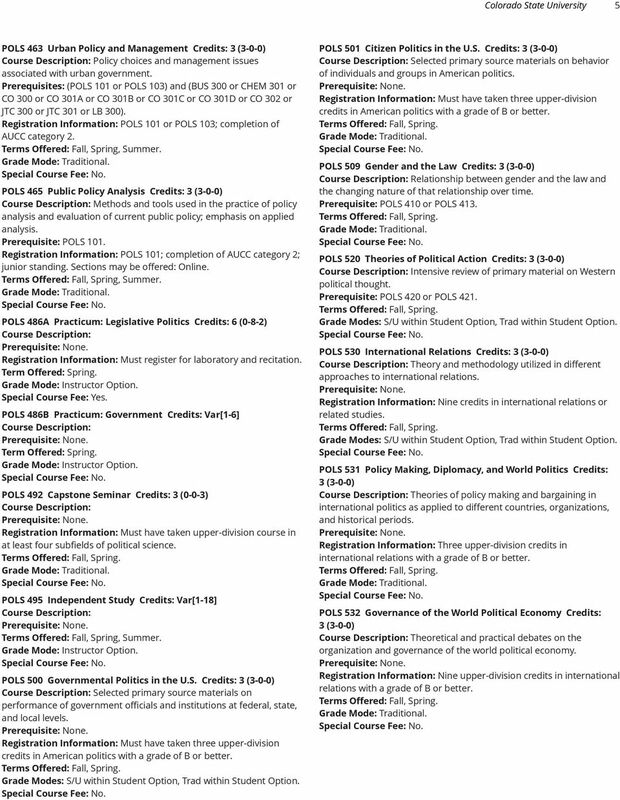 6 6 Department of Political Science POLS 540 Comparative Politics Credits: Theories, methods, and approaches to study of comparative politics. Registration Information: Three upper-division credits in comparative politics with a grade of B or better. POLS 541 Political Economy of Change and Development Credits: Responses of the state and its institutions to political, economic, and social change. Registration Information: Three upper-division credits in comparative politics with a grade of B or better. POLS 542 Democracy and Democratization Credits: Theoretical foundations of democracy and democratization across world regions. POLS 544 National Identities and Nation Building Credits: Also Offered As: ETST 544. How statist conceptions of race and ethnicity have been mobilized in nation-building projects. Registration Information: Credit not allowed for both POLS 544 and ETST 544. POLS 550 Advanced Public Administration Credits: Overview of study of public administration; recent developments in theory and practice. Registration Information: Written consent of instructor required. 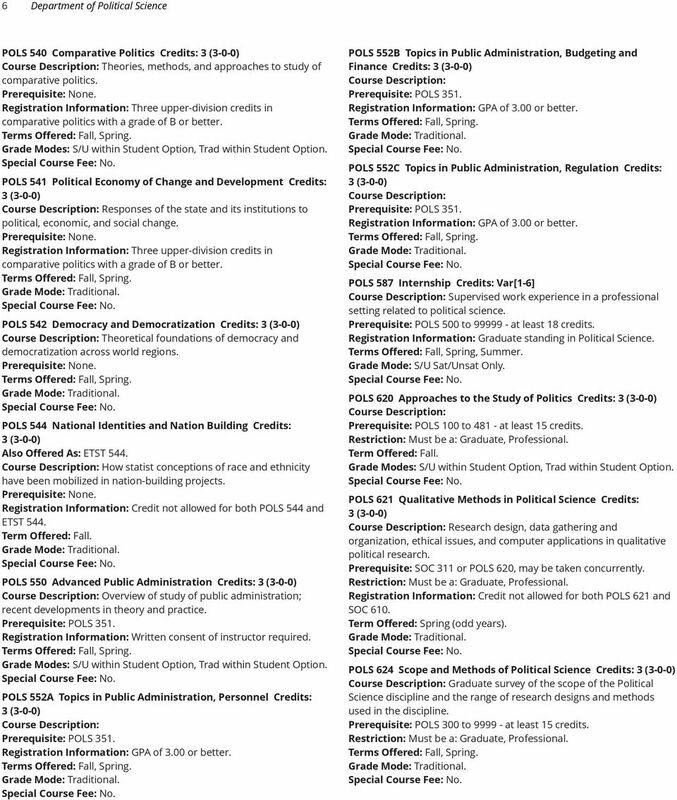 POLS 552A Topics in Public Administration, Personnel Credits: Registration Information: GPA of 3.00 or better. POLS 552B Topics in Public Administration, Budgeting and Finance Credits: Registration Information: GPA of 3.00 or better. 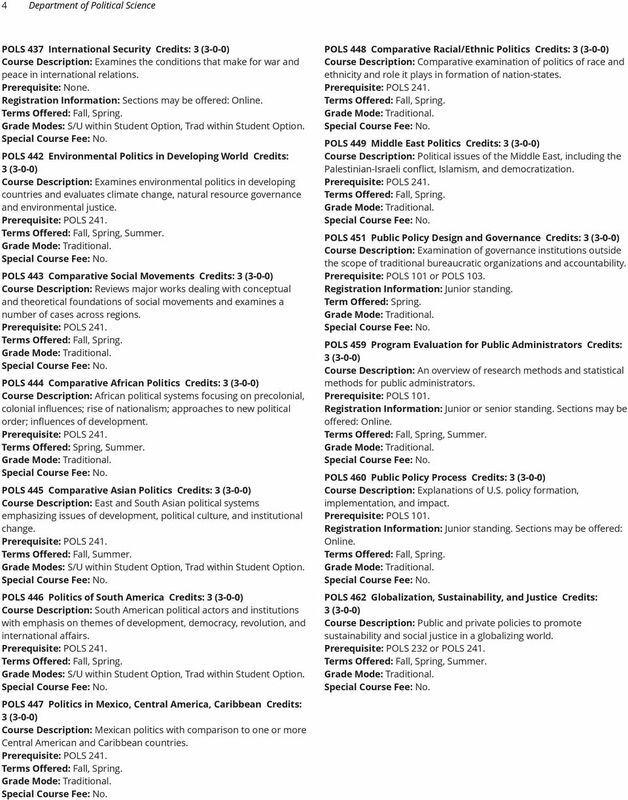 POLS 552C Topics in Public Administration, Regulation Credits: Registration Information: GPA of 3.00 or better. POLS 587 Internship Credits: Var[1-6] Supervised work experience in a professional setting related to political science. Prerequisite: POLS 500 to at least 18 credits. Registration Information: Graduate standing in Political Science. Grade Mode: S/U Sat/Unsat Only. 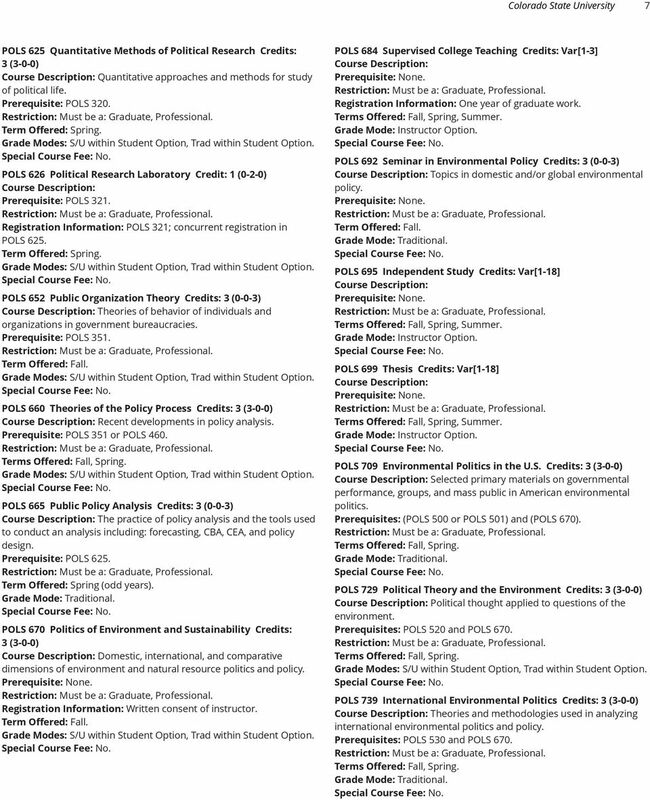 POLS 620 Approaches to the Study of Politics Credits: Prerequisite: POLS 100 to at least 15 credits. POLS 621 Qualitative Methods in Political Science Credits: Research design, data gathering and organization, ethical issues, and computer applications in qualitative political research. Prerequisite: SOC 311 or POLS 620, may be taken concurrently. Registration Information: Credit not allowed for both POLS 621 and SOC 610. Term Offered: Spring (odd years). POLS 624 Scope and Methods of Political Science Credits: Graduate survey of the scope of the Political Science discipline and the range of research designs and methods used in the discipline. Prerequisite: POLS 300 to at least 15 credits. 7 Colorado State University 7 POLS 625 Quantitative Methods of Political Research Credits: Quantitative approaches and methods for study of political life. Prerequisite: POLS 320. POLS 626 Political Research Laboratory Credit: 1 (0-2-0) Prerequisite: POLS 321. Registration Information: POLS 321; concurrent registration in POLS 625. POLS 652 Public Organization Theory Credits: 3 (0-0-3) Theories of behavior of individuals and organizations in government bureaucracies. POLS 660 Theories of the Policy Process Credits: Recent developments in policy analysis. Prerequisite: POLS 351 or POLS 460. POLS 665 Public Policy Analysis Credits: 3 (0-0-3) The practice of policy analysis and the tools used to conduct an analysis including: forecasting, CBA, CEA, and policy design. Prerequisite: POLS 625. Term Offered: Spring (odd years). POLS 670 Politics of Environment and Sustainability Credits: Domestic, international, and comparative dimensions of environment and natural resource politics and policy. Registration Information: Written consent of instructor. POLS 684 Supervised College Teaching Credits: Var[1-3] Registration Information: One year of graduate work. 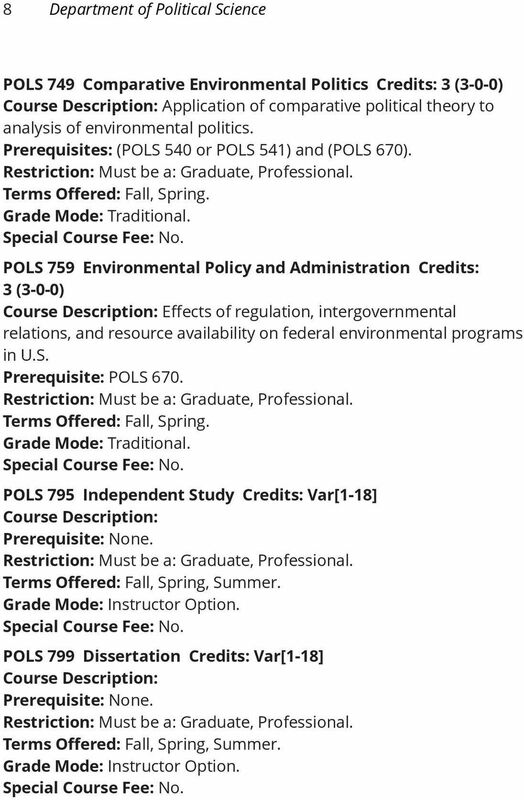 POLS 692 Seminar in Environmental Policy Credits: 3 (0-0-3) Topics in domestic and/or global environmental policy. POLS 695 Independent Study Credits: Var[1-18] POLS 699 Thesis Credits: Var[1-18] POLS 709 Environmental Politics in the U.S. Credits: Selected primary materials on governmental performance, groups, and mass public in American environmental politics. Prerequisites: (POLS 500 or POLS 501) and (POLS 670). POLS 729 Political Theory and the Environment Credits: Political thought applied to questions of the environment. Prerequisites: POLS 520 and POLS 670. POLS 739 International Environmental Politics Credits: Theories and methodologies used in analyzing international environmental politics and policy. Prerequisites: POLS 530 and POLS 670. Political Science-POLS (POLS) 1 POLITICAL SCIENCE-POLS (POLS) Courses POLS 101 American Government and Politics (GT-SS1) Credits: Principles, structures, and processes of American national government. Political Science Courses CPO 2002 INTRODUCTION TO COMPARATIVE POLITICS (3) Introduction to politics in different states; comparison and analysis of representative European and non-western political systems. DUAL DEGREE IN INTERDISCIPLINARY LIBERAL ARTS, B.A. AND ENGINEERING SCIENCE, B.S. CRIMINAL JUSTICE. CJ 0002 CRIME, LAW, AND PUBLIC POLICY 3 cr. CJ 0110 CRIMINOLOGY 3 cr. CJ 0130 CORRECTIONAL PHILOSOPHY: THEORY AND PRACTICE 3 cr. 190 P O L I T I C A L S C I E N C E POLITICAL SCIENCE (POSCI) Politics rules over everything you do as a human being and gives you an understanding that enables you to have more control over your own life. Graduate Courses. 713 PERFORMANCE CRITICISM (3). Introduction to the critical analysis and interpretation of performance events.